1. Set Program Goals: A city or campus needs to review overall program goals for mobility and how dockless bike share fits into the overall system. 2. Create a Policy Framework: Your city will need to establish a regulatory framework. 3. Establish System Boundaries: For system planning, most operators work with cities on boundaries for both testing pilots and program growth. Using geofencing technology, operators collect (and share) data that tracks usage, routes, system problems and more. In fact, the sheer amount of data points to the need for carefully planning data collection, privacy, analysis, storage, and decision support. 4. Focus on Bike Parking: In most cases, the greatest challenge is parking. All stakeholders need to establish, early on, that dockless does not mean users are able to leave bikes anywhere (an on-going problem as bikes are left in rivers and hanging in trees). Alternative approaches to physical bike racks may include using GPS geo fences to create pseudo stations/discreet areas to park bikes or painting rectangles on the ground to designate parking areas. 5. Integrate Programs: In many cities, transportation requires owning a car; other options are either insufficient or simply not available. The integration of New Mobility, mobility-on-demand models, and seamless transport apps will substantially increase the share of trips that are multimodal. 6. 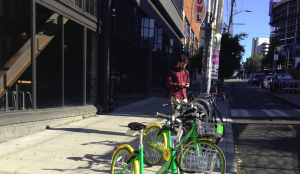 Continuously Monitor, Improve and Innovate: Dockless bike share systems face a lot of challenges. For example, supplying enough staff to constantly rebalance bicycles may become economically infeasible. However, there may be possibilities for new mobile docking stations that allow rebalancing of many bikes at once. Using data to rebalance strategically will be key to success.Another challenge is that the public may not tolerate a growing number of idle bicycles on sidewalks.